At the meeting point of the rivers Don and Urie, at Inverurie in Aberdeenshire, are to be found the striking remains of a late twelfth-century earthwork castle known as the Bass of Inverurie. Upon this giant mound of earth, which today dominates a modern graveyard, once stood an impressive castle constructed of timber. It was held by the Earls of Garioch who were members of the extended royal family of Scotland and the ancestors of King Robert the Bruce, until the end of the thirteenth century. 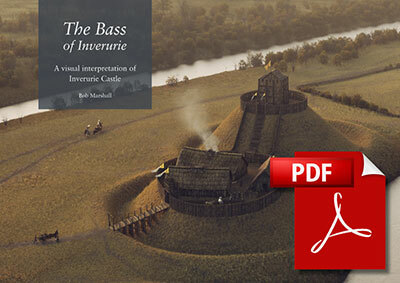 As my contribution to Scotland’s Year of History, Heritage and Archaeology in 2017, I explore and imagine what the Bass of Inverurie might have once looked like with the help of expert advice and with the aid of twenty-first century digital visualisation technology. The end result of my three-month-long project can be viewed in a PDF booklet which I have put together and you can download it from this page. With thanks to Simon Forder (The Castle Guy), Peter Yeoman, Will Wyeth, Claire Herbert, Aberdeenshire Council Archaeological Services and Historic Environment Scotland for their generous assistance and advice with this project. 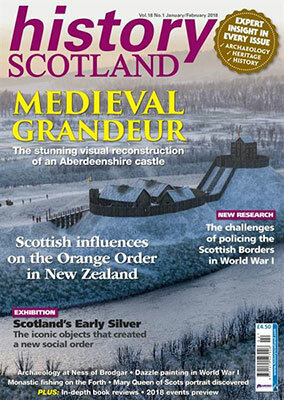 Look out for the Bass of Inverurie feature in the winter 2017/18 edition of History Scotland Magazine by writer and presenter David Weinczok.